For more years than we can count, on this Friday before Thanksgiving NPR Special Correspondent Susan Stamberg has presented her mother-in-law's unconventional recipe for cranberry relish — it's tart, time-tested, terrific for some tasters and terrible for others. The recipe is controversial — especially if you only like sweet cranberry sauce. Mama Stamberg's has the usual cranberries and sugar, but then you tart it up with onion, sour cream and — wait for it — horseradish. STEVE INSKEEP, HOST: Year after year, there are certain ways you know Thanksgiving is approaching. Election time has more or less passed. High school football is finishing up. College football is closing in on bowl season. You're debating people about whether the Christmas decorations went up too early. 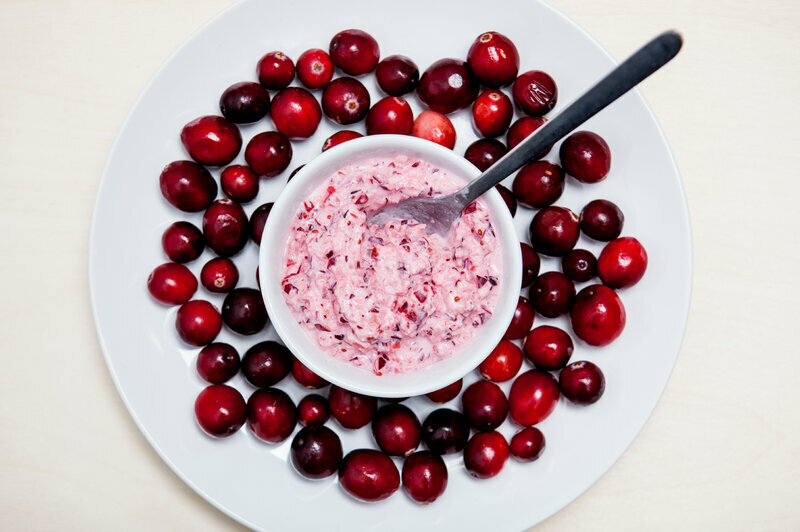 And as she has for nearly five decades, NPR special correspondent Susan Stamberg reminds us of one of the many reasons she is special - because every year, she shares the unconventional cranberry relish recipe of her mother-in-law, Mama Stamberg. SUSAN STAMBERG, BYLINE: This year we did an NPR call out, asked listeners for their Mama Stamberg's cranberry relish stories. Lots of responses from all over the country, for which many thanks. Now, the recipe is controversial, especially if you only like sweet cranberry sauce. Mama Stamberg's has the usual, cranberries and sugar. But then you tart it up with onion, sour cream and, wait for it, horseradish. I did not count up the yeas versus nays. I'm bad at math, and I was scared of the answer. But here are some listener comments. JOAN GOUDAKONS: I like doing something that is unusual. STAMBERG: In Evanston, Ill., Joan Goudakons (ph) took a chance on it. NINA TOTENBERG, BYLINE: My recipe? TOTENBERG: That awful recipe being my recipe? You are out of your freaking mind (laughter). STAMBERG: Well, Grace Schoettler (ph) in Colorado Springs loves the recipe. She wrote that last year when she ran out of relish and still had more turkey left, she was so disappointed she nearly threw out the rest of the turkey. In Wauwatosa, Wis., Laura Hopper says it's good on more than Turkey. Need a little zip for your ham sandwich, she writes. Bored with meatloaf? Mama Stamberg's to the rescue. And then there's latkes, the fabulous fried potato pancakes that Jews eat for Hanukkah. Jessica Lichtenfeld (ph) in Raleigh, N.C., loves the combination, but she has some advice. JESSICA LICHTENFELD: Don't skimp on the sour cream. Do not use light. Don't use Greek yogurt to make you feel better about yourself. A dollop of the relish is all you need. So a little sour cream is not going to hurt you. STAMBERG: The recipe went international this year, sort of. Andrea Haroldson (ph) made it 30 years ago when she lived in Massachusetts but hasn't since she moved to Iceland. ANDREA HAROLDSON: Well, there are no cranberries here, and there is no horseradish here. And until recently, there wasn't any sour cream here. And there's certainly no turkeys here. I've occasionally seen in the - maybe the last five years, like, a ratty old bag of Ocean Spray, but nobody knows what to do with cranberries here. So it's hopeless. STAMBERG: Too bad. After you get all the ingredients mixed - the recipe is at npr.org, by the way - you put it in the freezer. In Iceland, all you'd have to do is put it outside. Now we get to the converts, people who for years heard me say the relish comes out a beautiful shocking pink - OK, the color of Pepto-Bismol, which for some reason turned them off. Meet Andy Milder (ph) in Manhattan Beach, Calif. I wore him down. ANDY MILDER: Well, I had heard you talk about this recipe over and over again. And finally driving up the 405, I yelled out in my car, you won, Susan Stamberg; I will make your cranberry stuff. STAMBERG: And he's made it ever since. Now to be fair, there were some naysayers. Vicki Ross-Rhoades in Northern Minnesota thought it tasted awful. She wrote, even my brother Dusty, who generally eats anything, didn't like it. Pam Devour (ph) in Atlanta wrote that her family liked the macaroni and cheese better. Kathy Zeidlik (ph) in Columbia, Md., says she has a great cranberry recipe if we were interested. So does Nina Totenberg. TOTENBERG: I get those cranberries. I put one cup of water and a little bit of orange juice and sugar. And then I cut up pieces of orange. Then I put it in the fridge, and it's really quite good and very simple. STAMBERG: Well, without horseradish, it couldn't beat mine. Thank you so much. STAMBERG: OK, the grand finale. David Timothy in Salt Lake City, Utah. DAVID TIMOTHY: Well, I'll just have to say I've made this recipe several times but with the following substitutions. STAMBERG: You made substitutions in my mother-in-law's sacred recipe? TIMOTHY: I'm sorry to say that I did. But yes, that's the way I make it. I use black beans instead of cranberries. STAMBERG: Wait, you're putting black beans instead of cranberries? TIMOTHY: Yeah. Instead of sour cream and sugar, I use chili powder. Instead of horseradish, I use hamburger. STAMBERG: (Laughter) Is there nothing that you retain from the original recipe? TIMOTHY: Yeah, I still use the onion. STAMBERG: I love chili but at Thanksgiving? TIMOTHY: Well, you know, Thanksgiving comes just once a year. You can eat chili anytime. STAMBERG: Happy Thanksgiving, everybody. I would hold the beans if I were you. Susan Stamberg, NPR News, Washington.